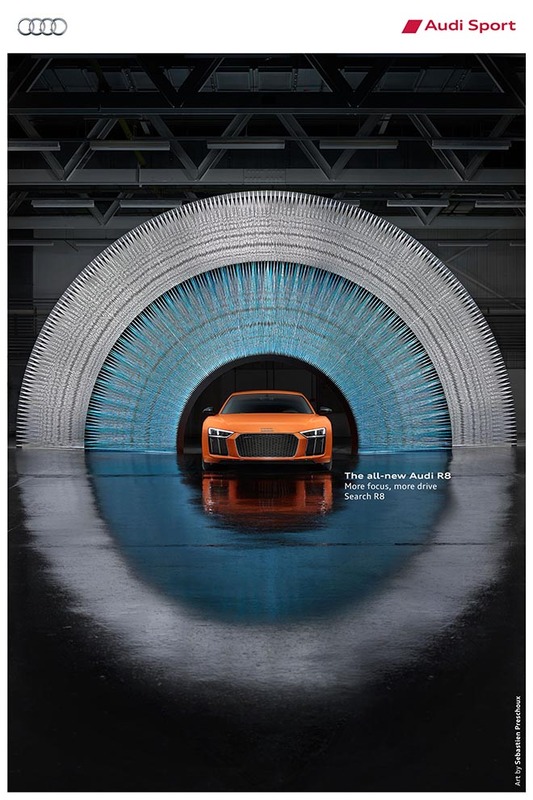 Audi is promoting the exhilarating thrill of driving the all-new Audi R8 with an integrated advertising campaign featuring impact the experience has on the human eye and the human heart. “The Eye”, a 60 second commercial, focuses on a pupil dilating in response to the excitement generated by the roar of the Audi R8. The tagline: ‘More focus, more drive’. An outdoor, digital and print campaign is centred on installations by French visual artist Sebastien Preschoux and Japanese artist Yasuaki Onishi. Preschoux has created an eye, 5.5m high and 9m wide, built from a complex array of specialist blue and white thread, while Onishi’s installation represents a heartbeat from the electrocardiogram readout of an R8 driver. 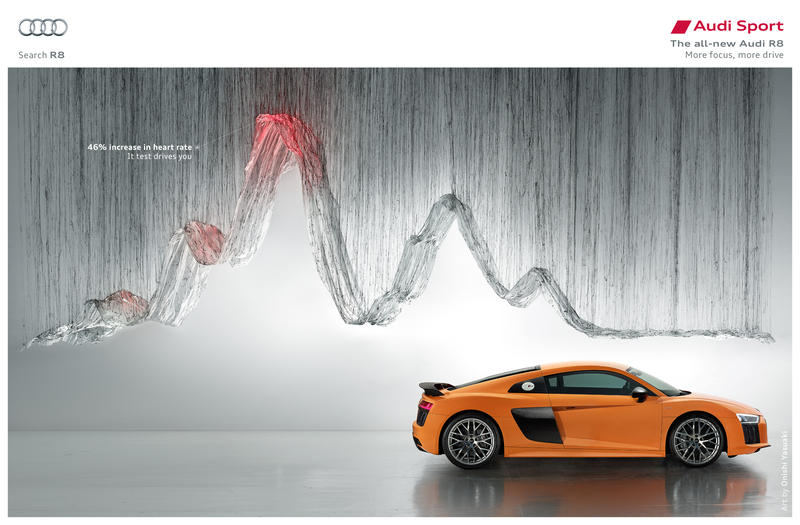 Biometric data was gathered during a racetrack lap to measure the effect of the R8 on the human body. 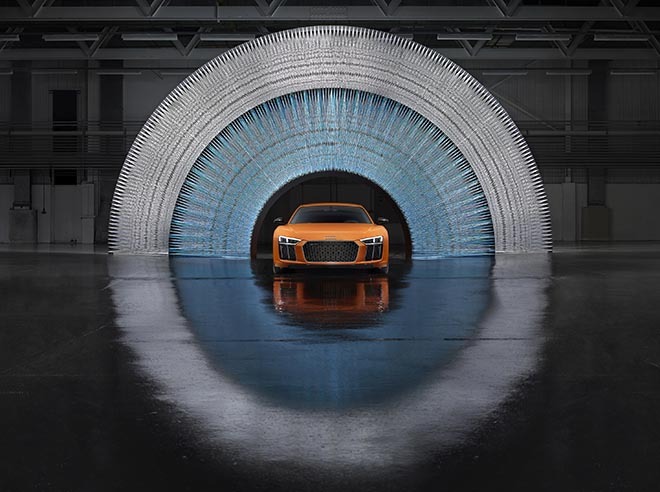 The data was then used in the film to illustrate the visceral thrills associated with the R8 V10 plus, which has a top speed of 205 mph and powers from 0 to 61 mph in just 3.2 seconds, making it the fastest road-going Audi to date. The Audi The Eye campaign was developed at BBH London by creative director Ian Heartfield, creatives Sam Oliver and Shishir Patel (TV), Vinny Olimpo (print), agency producer (TV) Chris Styring, assistant producer Jen Wood, producer (print) Aine Donovan, strategy director Will Lion, chief strategy officer Jason Gonsalves, business lead Polly McMorrow, account manager Natasha Thirlby, account directors Caroline Shortt and Naphtali Torrance, working with Audi national communications manager Sarah Cox. Filming was shot by ManvsMachine director Mike Alderson, via Friend London, with executive producer Luke Jacobs, producer Richard Fenton, and director of photography Alex Barber. Post production was by 3D artist Simon Reeves at Analog Studio, with work also done at The Mill, Electric Theatre Collective and Framestore. Sound was produced by Will Cohen and Andy Stewart at String and Tins with producer Sam Brock. Art by Sebastian Preschoux and Onishi Yasuaki was photographed by Benedict Redgrove.